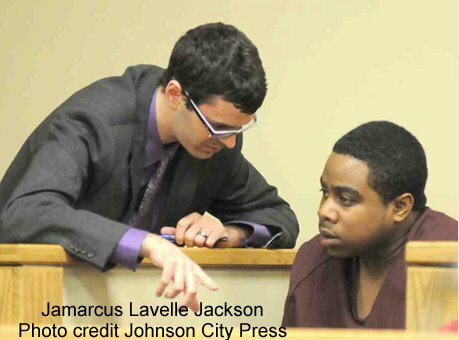 In 2017 African American male Jamarcus Lavelle Jackson was sentenced to 40 years in prison for the 2nd degree murder of "DeShaun Wesley Greer, 24, 1412 E. Cedar St., Bristol, VA., and trying to kill Jamison Lewis Greer, 20, same address." This is another typical black on black killing nobody wants to address. Jackson had six previous felonies, a model citizen that if he was in jail where he belonged this wouldn't have occurred. Greer was a basketball player with King University. Some sources quote Jackson saying his criminal record kept him from getting a job. He was on parole for previous felonies. He was nailed by a federal judge for a stolen gun in possession of a convicted felon. That got Jackson another 10 years for that. GREENEVILLE, Tenn. - On March 23, 2016, Jamarcus Lavelle Jackson, 26, of Johnson City, Tenn., was sentenced by the Honorable J. Ronnie Greer, U.S. District Court Judge, to serve 120 months in federal prison. Jackson was previously convicted at trial of being a felon in possession of a firearm. In March 2014, officers with the Johnson City Police Department responded to a shooting at the Battery, a bar/restaurant located downtown. Upon arrival, officers found Jackson being restrained by a group of people. Several victims, all suffering gunshot wounds, were also discovered. When interviewed, numerous witnesses identified Jackson as the shooter and recalled seeing him leave the scene, only to return minutes later to commit the shooting. Testimony at trial showed that Jackson had left to retrieve the instant firearm from his vehicle. As he began shooting, witnesses tackled and subdued him, forcibly removing the gun from his hand. He was placed under arrest once police arrived. One victim died of his wounds. Three other victims recovered from their injuries. Jackson will now return to state court where he faces charges of first degree murder, attempted second degree murder, aggravated assault, and reckless endangerment. This investigation was the product of a partnership between the Johnson City Police Department, and Bureau of Alcohol, Tobacco, Firearms, and Explosives. Assistant U.S. Attorney Nick Regalia and Special Assistant U.S. Attorney Corey Shipley represented the United States. A Johnson City man charged in a weekend shooting death in downtown Johnson City was arraigned in Washington County General Sessions Court Monday. Jamarcus Lavelle Jackson, 24, 1211 King Springs Rd., is charged with second-degree murder, attempted second-degree murder, aggravated assault, reckless endangerment , unlawful possession of a firearm by a convicted felon and possession of marijuana. "It seems like you’ve got a pretty good handle on what you’re charged with," Arnold said after Jackson had rattled off the charges against him. Arnold appointed the public defender's office to represent Jackson after reviewing a application for a lawyer and asking Jackson about his not having a job. "With by background, I couldn't get a job," Jackson said. He said he lives with his girlfriend and she supports him financially. Jackson was arrested early Sunday morning after Johnson City police responded to a shooting in the Cherry Street Parking lot. He is accused of shooting and killing DeShaun Wesley Greer, 24, 1412 East Cedar St., Bristol, VA., and trying to kill Jamison Lewis Greer, 20, also of 1412 East Cedar St., Bristol, VA.
Police said Jackson fired numerous gunshots in the parking lot, and two other men were injured. He was charged with aggravated assault for "inflicting injury with a deadly weapon" on Zachary Breedlove, 23, 159 Alfalfa Lane, Jonesborough, and with reckless endangerment for "reckless activity of discharging a firearm" that resulted in an injury to Jonathan McInturff, 27, 944 Larry Mills Lane, No. 1, Kingsport. Summary Virginia crime for 2015: Black males ~7% of the population commit over half of all the violent crime in Virginia including the majority of murders, three-fourths of the robberies, over half the assaults, and almost half the burglaries. In Norfolk the press even tried to cover up a violent racial attack on their own reporters! The attitude of the police was appalling. Another man was nearly killed in DC for asking a black male to not litter in front of his apartment. Murder victims includes a black kid, a teenage white girl, a pizza shop worker, another man beat nearly to death by black gang. Now the same black on black killing and violence has come to Bristol as I will be reporting. The idea is not to deride anyone but force the Press to stop hiding the facts so we can address the problem. Black Racism or Opportunism in New Orleans?